Ly Tran was born in Guam in 1975 after the Vietnam War. She is a big dreamer. She knew early on she wanted to be in the business of inventing new ways of communication and today is widely seen as one of the more bold thinkers in the digital creative space. Tran’s digital journey began in the early ‘90s in the admissions office of Emerson College, where she developed her school’s first website and email program, teaching herself HTML while taking classes and touring prospective students and parents. With her sights set on advertising, she graduated and moved to LA, spending the next few years creating new digital services for global agencies like BBDO, Grey and McCann Erickson; on brands like Apple, Pepsi, Mars, Inc., Warner Brothers and Texas Instruments. Eager to leave holding-company life she headed to Texas, and joined Houston independent shop Fogarty Klein Monroe where she launched their in-house digital practice and ran digital strategy on Nestle, Popeye's, Barbados Tourism and Emirates Airline. In 2008, Tran joined Austin-based indie agency, Proof Advertising, as Chief Digital Strategist, taking them from next to zero in digital billings to tens of millions in their first year. She has since made digital, social and mobile a significant portion of the agency's offering and expertise. 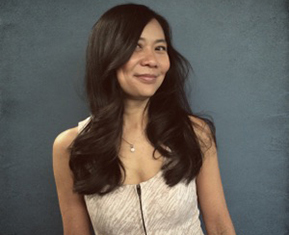 Tran currently heads up all of Proof’s consumer audience planning as Associate Partner and Chief Media Officer. She manages a team of 30 traditional and digital media employees that she affectionately dubs her "Tradigital" team. Tran fosters a new way of thinking and organically merging disciplines for the benefit of all Proof clients, including, Subway Restaurants, Texas Tourism, Apothic Wines, Mouser Electronics and Sabre Technology. Tran has made it her mission to mentor the industry’s future innovators and rising stars, recruiting and grooming young talent to Proof while also getting highly involved outside of Proof with AWAW, Ad Women for All Women, a program aimed to introduce all young women in high school and college to advertising.